. : Farm Forest Line - Harvesting, transporting and marketing logs:. Often farmers discover that their timber plantations or native forests are unviable to harvest due to the low value of the trees and the high costs of access, harvesting, loading and transport. The economics of harvesting dictate that where the logs are low in value, the operation must be highly mechanised in order to be viable. The equipment required for mechanized logging is very expensive and the contractors involved commonly prefer large forest areas with relatively easy access. If a farmer has year round access for harvesting due to good roads and well drained, sandy soils, they may be able to harvest when contractors are otherwise idle during the wet season. Site characteristics that increase logging costs are slope, dense undergrowth, exposed rocks, distance to made roads, soil types and creek crossings. 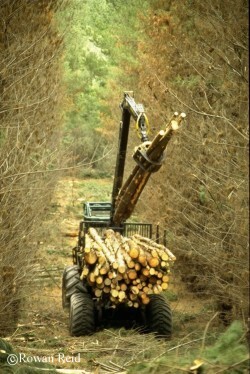 Adapted farm equipment, such as tractors, and manual felling with chainsaws is only viable where the log value is high. Research in Australian pine plantations suggests that manual felling and tractor log skidding will only be viable in well-spaced, pruned stands of large diameter sawlogs (over about 40cm). The advantage of pruning is that it greatly reduces the labour required to de-limb and allows the trees to be more widely spaced, making felling and access easier. The point of sale is commonly the mill door. Transport costs can be as high as 10c/km/tonne, thereby reducing the payment to the grower by more than $10 per cubic meter for logs that need to travel over 100km to get to the mill. For farmers considering planting or harvesting relatively small areas (less than say 20 hectares) or low volumes (less than say 2000 cubic meters), careful thought should be given to value adding on the stump and designing their plantations for easy access so as to reduce the impact of harvesting costs.